An installation on two floors. Upstairs, an actor in a feather jacket slowly unravels a rope as it emerges from the wall. 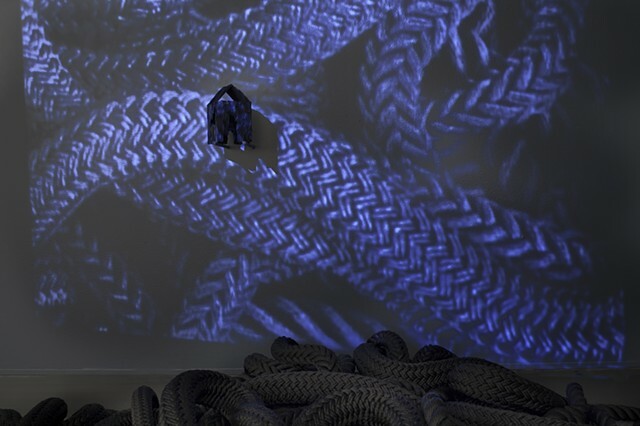 Downstairs, a video is projected over a large pile of rope and a precarious feathered "house". The sound of whispered voices plays in the space, their meaning always just out of reach. Performer: Shirah Neumann. For the exhibition: "Maine Women Pioneers III, Vanguard" at the University of New England Gallery, Portland, Maine.